Identification: This species has an extremely slender body and very long cerata. (Note 1) The cerata usually appear straight when the animal is crawling in the open at night but show "corkscrew" tips when slightly contracted in response to disturbance. The rhinophores are simple. 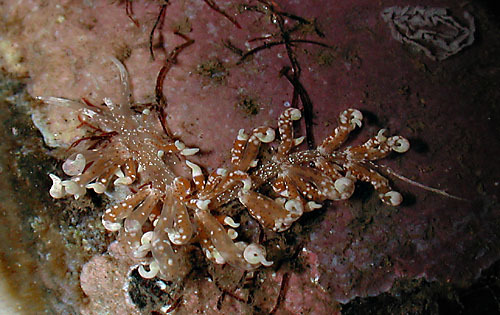 The cream body and cerata are decorated with white blotches and the cerata have white tips. The branches of the digestive gland have short side pockets that are usually dark brown giving the cerata and body a speckled appearance. A touch of blue iridescence is often noticeable subapically on the cerata. Natural history: Phyllodesmium sp. #1 is a moderately common aeolid found in the low intertidal and very shallow subtidal at protected to semi-protected cobble beaches. Rarely, it's been found to 7 m (22 ft). It's nocturnally active but may be found during the day on the undersides of rocks, often in pairs. It has been observed feeding on a small, unidentified octocoral (currently under study by Phill Alderslade, Sam Kahng, & Gary Williams) and is often closely associated with its host in the field. (Note 2) It appears to feed preferentially on the stolons and retracted polyps. It may also get some nutrition by retaining functional zooxanthellae in its digestive gland. (Note 3) The egg mass is a "kinked" white spiral 5-6 mm in diameter with a 1 mm high ribbon. Hatching occurs in about four days in the laboratory. Distribution: Big Island, Maui and Oahu: also known from Enewetak Atoll and Heron Island. Taxonomic notes: First recorded in Hawaii from Hekili Point, Maui by CP in August, 1983. Photo: CP: Hekili Point, Maui; May 12, 2002. Note 1: A 17 mm animal collected in Sept., 1988 was held for several days in a small dish with a basalt cobble having openings only 1-2 mm in diameter. Nevertheless, it managed to "disappear" completely during the day and "reappear" at dusk. Perhaps, the ability to hide in extremely narrow crevices allows it to better resist dehydration in the low intertidal? Note 2: The host octocoral of this species is also unusual in that it lives almost exclusively in the intertidal. It grows on the undersides of cobbles, but near their edges, at the boundary between the algal and sponge communities. The polyps may be widely spaced and arise from a stolon that is usually buried in the algal/invertebrate turf. They can fully retract when disturbed. Note 3: An animal found on April 12, 2002 was offered a cobble with a colony of its host octocoral on April 16. It was observed feeding on the stolons and closed polyps of the octocoral over several days. During feeding, the side branches of its digestive gland became noticeably darker suggesting that it may be concentrating zooxanthellae from its food in those pockets. (see photos) The darker appearance persisted for several days and most animals seen in the field have dark pockets when found. That may indicate that the zooxanthellae remain functional long enough to contribute to the nutrition of the animal. This possibility is also supported by the fact that the species typically spends the day resting near its host in the same "twilight zone" conditions that the coral's zooxanthellae are presumably adapted to. The branches of the digestive gland also appear more elaborate than those of species that feed on azooxanthellate corals (although less elaborate than in most species that are known to rely extensively on zooxanthellae).